Port of Miiduranna is situated in the Bay of Tallinn. The geographic coordinates are: 59°30,0´N, 24°49,0´E. Miiduranna tee 53, Viimsi vald, 74015 Harju maakond. The port is working all year round. Channel No 10 will be used for VHF communication. Call sign “Miiduranna”. The port control officer also answers the callings from channel No 16. The port is in operation 24/7. 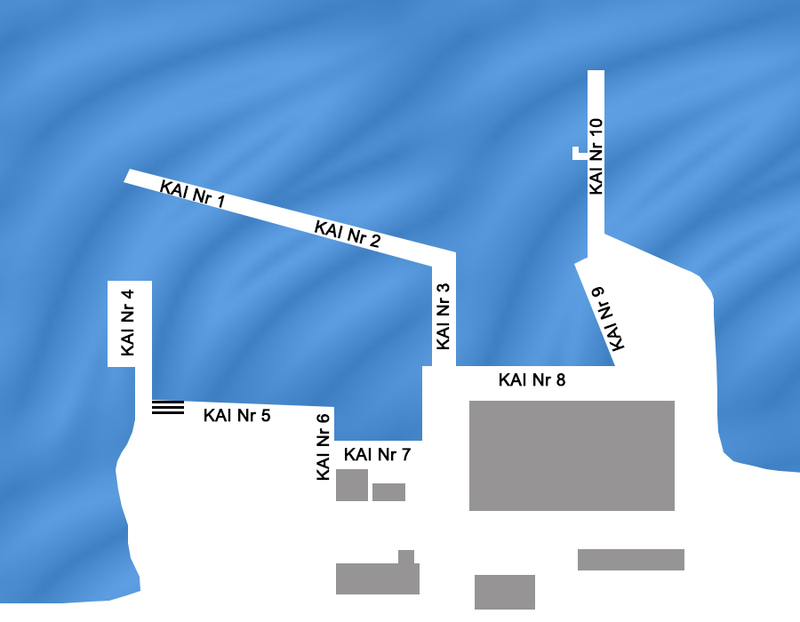 The water area of the Port consists of two pools: south basin and north basin. There are 10 quays in the port. The total length of quays is 878 meters and the depths vary between 2,5 meters – 13 meters. depth up to 12,3 m.
depth up to 5,6 m.
The Harbour Master may grant permission to serve larger vessels if necessary, by introducing additional safety. The port’s scheme and the layout of navigation aids for navigation and signs is indicated on the scale map 2M2089 or newer and its extract. The map is available at any time in the the port control office. Light beacon No 235, white metal pillar, light QR, has been fixed to the mole end of the south basin of the port. The end of the breakwater of quay No 10 is equipped with light beacon No 237, red metal pillar, light F1 W 3s. Leading lights No 233, green radiation Fl(2) G 3s, and No 234, green radiation Oc G 5s with a direction 224°,3 – 44°,3 have been installed by the north basin and tanker (oil products) quay No 10. In the direction of the leading lights, the channel is 900 m long and 110 m wide and with the depth of 13 m.
Lateral system buoys may have be installed to the left side of the channel (database No 236, Fl R 3s 3M and No 240, Fl R 3s 3M). West spar buoy No 1031 has been installed west from quay No 4. The spar buoy facilitates the manoeuvring of ships near quay No 4. The entry procedures will be arranged by the owner or agent of the ship. For fishing vessels the formalities will be arranged by the owner of the vessel. For small vessels the formalities will be arranged by the vessel’s captain. The Port Authority will notify the ship owners and agents about the epidemic prevention rules. Pilot Service by Eesti Loots Ltd. Channel No 10 will be used for VHF communication. Call sign “Miiduranna”. The port control officer also answers the callings from channel No 16. Telephones: +3726054314, +37253421543. Harbour master: +3726054312, +3725128188. E-mail: kapten@miidurannasadam.ee. Fax: +3726054316. The port control officer is available in port office 24/7. All necessary information can be obtained.